Behind every initiative to share spectrum are models of how radio waves in a particular band travel, or propagate, through different environments. How far will a signal travel before it becomes too faint to be useful or to interfere with another signal? What happens when a signal encounters a tree, or a hill, or a house? If we can accurately model how radio waves will behave, it can dramatically increase the odds that sharing mechanisms will work. Accurately measuring real-world spectrum usage and the performance of spectrum-dependent systems is the best way to improve and validate propagation models. NTIA’s Institute for Telecommunication Sciences (ITS) has been a primary resource in designing and conducting measurement campaigns, applying its decades of experience to ensuring measurements are accurate and provide meaningful data. Now, ITS is releasing a handbook of best practices for propagation measurements, outlining how to calibrate, document, verify, and validate these measurements. This handbook – “Best Practices for Radio Propagation Measurements” – builds on working papers developed while ITS was working with the Defense Spectrum Organization (DSO) to help improve propagation models used by the DSO’s Spectrum Sharing Test & Demonstration program. Exemplifying the power of partnerships, NTIA recently teamed up with the White House Initiative on Historically Black Colleges and Universities (HBCUs) and Johnson C. Smith University to convene a broadband summit for HBCUs in North and South Carolina. On Nov. 15-17, faculty and administrators from 17 of the states’ combined 19 HBUCs, as well as government and industry representatives, gathered in Charlotte, N.C., for the fifth annual meeting of the Carolinas Alliance for Success in Education (CASE). The summit’s title, “Smart HBCUs Disrupting the Digital Divide: Connecting Campuses to Communities through Broadband,” reflected a focus on the technology’s ability to fuel HBCUs as engines of economic growth. Former Federal Communications Commissioner Mignon Clyburn opened the summit by challenging the audience to exploit broadband connectivity to leverage the legacy of HBUCs as essential community anchors that educate students and serve their neighboring communities. Jonathan Holifield, Executive Director of the White House Initiative on HBCUs, emphasized the integral role of HBCUs in advancing America’s global competiveness. He urged North and South Carolina HBCUs to prepare students to become “dual pipelines of productivity” as higher impact employees creating value for their employers and higher growth entrepreneurs of innovative enterprises. As public safety agencies around the country take advantage of FirstNet, the first nationwide public safety broadband network (NPSBN), NTIA is marking the end of a grant program that helped lay the groundwork for FirstNet’s success. In 2013, NTIA awarded $116.5 million in grants to 54 U.S. states and territories under the State and Local Implementation Grant Program (SLIGP). The funding helped prepare recipients for consultation with FirstNet, and allowed recipients to conduct stakeholder outreach to better understand the needs of public safety stakeholders. In less than five years, SLIGP grant recipients engaged more than 350,000 stakeholders, facilitated more than 2,700 governance and planning meetings, and distributed more than 6 million resources, including guides, pamphlets, briefing sheets and e-newsletters. Tennessee used their SLIGP funding to develop a “scorecard” website to motivate stakeholders to complete training that would prepare them for optimal participation in the NPSBN. Texas created informational videos and an e-learning portal for public safety broadband, which helped keep stakeholders informed and engaged. In 2015, the Federal Communications Commission (FCC) established the Citizens Broadband Radio Service (CBRS) to accommodate sharing in the 3.5 GHz band between incumbent users — mostly Navy radar systems — and a variety of new commercial users. The technology that will power this sharing, a new kind of dynamic spectrum access system, didn’t exist when the FCC adopted the rulemaking three years ago. To help test this technology as it was being developed, the FCC sought out the independent technical expertise of NTIA’s Institute for Telecommunication Sciences (ITS). The data gathered via these laboratory tests will be provided to the FCC to support its certification processes for eventual CBRS field operations. We have made significant progress in our work on testing the two technical linchpins of these CBRS systems: Environmental Sensing Capability (ESC) sensors and Spectrum Access Systems (SAS). The ESC sensors are designed to alert the associated SASs when Federal radar systems are operating in the band, so that the SAS can take immediate action to manage the CBRS devices to prevent interference. ITS has released a study guide for Spectrum Access System testing via GitHub. The guide consists of samples of tests that will be conducted on Spectrum Access Systems. The tests will include a wide variety of scenarios and situations to test the systems’ ability to manage CBRS devices. Protecting intellectual property rights is a critical government responsibility that helps grow our economy. It is equally as important to ensure that measures intended to protect these rights aren’t misused to stifle innovation or the free flow of information. NTIA advises the U.S. Copyright Office every three years on proposed exemptions from the Digital Millennium Copyright Act’s (DMCA) prohibition against circumventing copyright protection technologies. These exemptions enable teachers to use short video clips in the classroom, facilitate valuable cybersecurity research, and allow consumers to repair their own vehicles without infringing on copyrights. They help balance intellectual property rights and the right to make non-infringing uses of lawfully obtained works, both of which are critical to innovation. Today, the Librarian of Congress issued the latest set of exemptions, based on recommendations from the Copyright Office. The Copyright Office’s recommendations were thoughtful, balanced, and based on the record and the law, and NTIA is pleased with the results of the rulemaking process. The demand for more spectrum capacity is intense, and its wise allocation is a top priority as our nation builds out fifth generation (5G) wireless networks. By 2021, Cisco projects that global mobile data traffic will increase sevenfold, with 5G generating 4.7 times more traffic than 4G. 5G promises new capabilities and possibilities for our Nation’s innovators. Americans, ever the pioneers, are pushing forth a renaissance in space exploration and development, with our commercial satellite industry continuing to flourish and creating thousands of new jobs. Meanwhile, federal agencies require access to spectrum to support 21st century missions that protect our nation, make transportation safer, and pave the way for vital scientific research. To put it mildly, we have our work cut out for us as we address all these diverse and important needs. To meet this challenge, President Trump has called for a comprehensive national strategy for managing spectrum resources. This strategy will help ensure America’s national and economic security and fortify our continued leadership in wireless communications technologies. The Presidential Memorandum addresses immediate needs and sets goals that will carry us well into the future, so our nation can build a long-term, sustainable spectrum access framework. The International Telecommunication Union (ITU) will convene its quadrennial treaty-making conference in Dubai later this month. The ITU is a United Nations agency representing 193 countries that allocates global radio spectrum and satellite orbits, manages international standards for telecommunications networks and technology, and works to improve access to these technologies in the areas of the world that do not have it. Among other important agenda items during the three weeks of meetings that begin Oct. 29, the ITU will vote on its five elected leadership positions. The United States has put forward a candidate for one of those positions: Doreen Bogdan-Martin is running to lead the ITU Bureau of Telecommunication Development (BDT), which works to empower developing countries with tools to expand connectivity. This week, NTIA recognizes International Digital Inclusion Week. Digital inclusion is more than a social program giving people access to computing and information technology; it is now an economic imperative in every community. The availability of robust Internet access is integral to a community’s ability to thrive socially and economically. Better connected towns, cities and states attract technology-based investment, encourage more innovation, streamline supply chains, and broaden opportunities for individuals and businesses. Local leaders at all levels find that broadband planning and investments reap benefits across the economy in education, healthcare, agriculture, transportation, tourism, and daily quality of life. Early this year, I had an opportunity to represent the United States at the International Digital Inclusion Policy and Research Conference in Liverpool, England. The conference afforded NTIA the opportunity to highlight several important trends that are driving broadband access and digital inclusion in the United States. We see policy and economic initiatives at the federal, state and local level around well-structured planning, program integration, library modernization, and performance measurement. Underlying these trends is the drive to streamline regulation and create the incentive for broadband infrastructure investment. 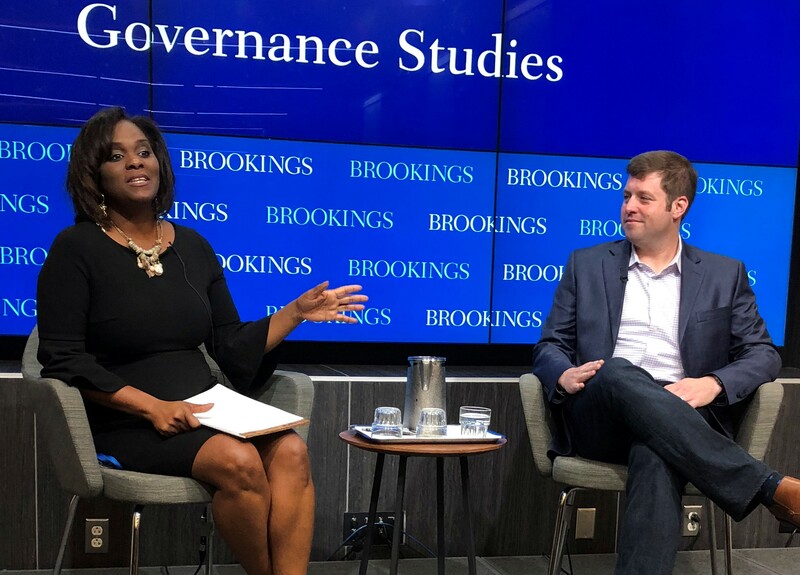 On Oct. 12, Assistant Secretary for Communications and Information David Redl participated in a fireside chat with Brookings Institution fellow, Dr. Nicol Turner-Lee, to discuss the work that NTIA has been doing on privacy, the Internet, and nationwide broadband connectivity. “The Trump Administration has taken a very pro-investment, pro-broadband stance from the very beginning,” Redl said, an approach that that will help push America forward into the next generation of communications technology. Citing the Administration’s early work to the extend broadband to rural areas, Redl said that the White House directed NTIA and the Department of Agriculture to develop a strategy for connecting areas of the country that are difficult to reach. Redl also noted Commerce Secretary Wilbur Ross’ efforts to deliver on the President’s commitment to lead the United States into a new era of space commerce, which has included elevating the Office of Space Commerce to report directly to the Secretary, raising its importance within the Department. Privacy and security online continue to be major issues for Americans, according to an NTIA survey conducted by the U.S. Census Bureau. Nearly three-quarters of Internet-using households had significant concerns about online privacy and security risks in 2017, while a third said these worries caused them to hold back from some online activities. About 20 percent said they had experienced an online security breach, identity theft, or a similar crime during the past year. However, the 2017 survey showed a decline in households reporting concerns and avoiding certain online activities compared with the 2015 survey, which first asked these questions. The proportion of online households reporting privacy or security concerns fell from 84 percent to 73 percent during this period. Similarly, the proportion of online households that said privacy concerns stopped them from doing certain online activities dropped from 45 percent to 33 percent. Since 1994, NTIA has regularly commissioned the U.S. Census Bureau to conduct surveys on Internet use. In the latest survey, which went into the field in November 2017, over 43,000 of the more than 52,000 interviewed households reported having at least one Internet user, and those Internet-using households were asked the privacy and security questions.